HIGH QUALITY HDMI CABLE 75CM SHORT LEAD HIGH SPEED WITH ETHERNET - Short HDMI Cables, Hdmi Cables Same Day Dispatch On Our Leads If You Order Before 2pm Weekdays. High Speed With Ethernet HDMI Cable. 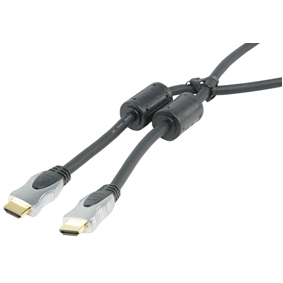 These HDMI cables are fully version 1.4 compliant with double shielding and dual ferrite suppressors. Ideal for longer cable runs. HDMI (High-Definition Multimedia Interface) is the first industry-supported, uncompressed, all-digital audio/video interface. HDMI provides an interface between any audio/video source, such as a set-top box, DVD player, and A/V receiver and an audio and/or video monitor, such as a digital television (DTV). HDMI cable supports standard, enhanced, or high-definition video, plus multi-channel digital audio on a single cable. It transmits all ATSC HDTV standards and supports 8-channel digital audio, with bandwidth to spare to accommodate future enhancements and requirements. Great quality HDMI lead for the price. HDMI Leads. HDMI to HDMI cable. HDMI to HDMI lead. These cables were updated in Spetember 2013 to version 1.4 High Speed With Ethernet. Currently viewing: HIGH QUALITY HDMI CABLE 75CM SHORT LEAD HIGH SPEED WITH ETHERNET - Short HDMI Cables, Hdmi Cables Same Day Dispatch On Our Leads If You Order Before 2pm Weekdays.